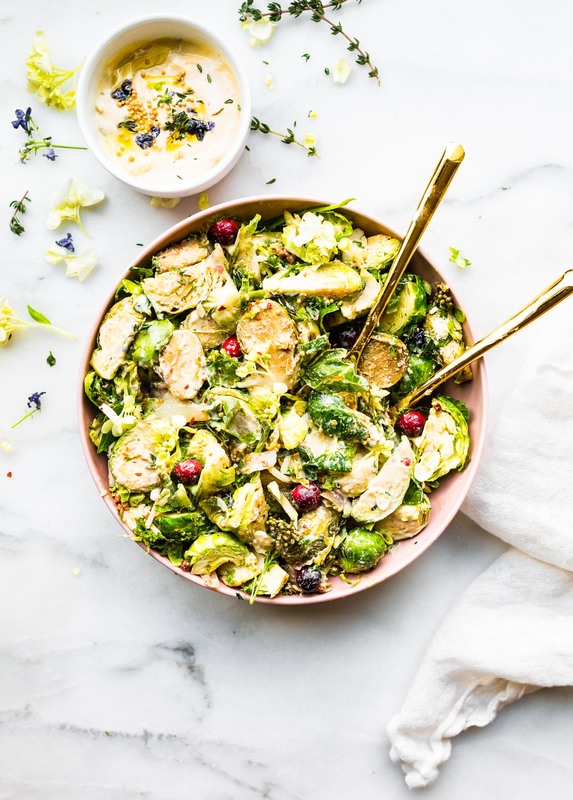 Creamy Mustard Brussels Sprouts Salad! A sautéed Brussel Sprouts dish tossed in a vegan creamy cashew mustard sauce. Quick to make, packed with fiber, healthy fats, and nourishment! 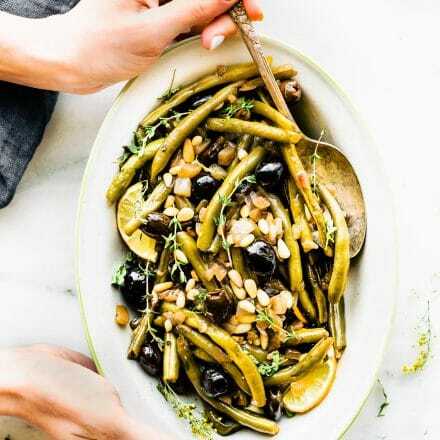 A healthy paleo side dish to add to your table. Oh hey there veggies and all things to make a SUPERFOOD! You are needed today. You are wanted. 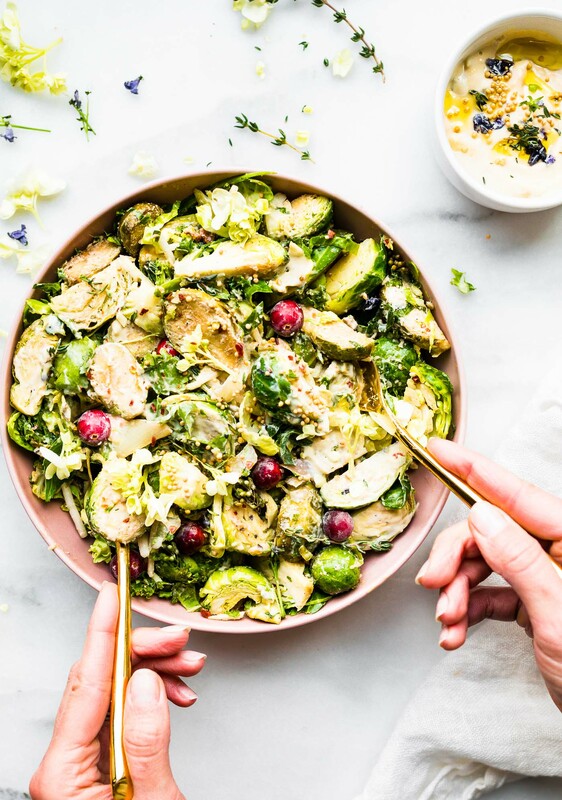 Actually, after a whole lotta crustless pie and this creamy sauteed brussel sprouts salad sounds like the perfect way to round out the week, don’t you think? Plus have I mentioned that creamy sauces make me swoon? You think I’m kidding. But ya’ll, this one is extra creamy because of CASHEWS! I digress… focus Lindsay. Focus. But before I dive into this Brussel Sprouts dish, here’s a little secret …err confession. I have been sick for the past month. Like … the crud that never ends. Lingering. And yes, I haven’t been to the doctor. Gasp, I know! I’m so old school. But you see, I am re-sharing (and upgrading) this Creamy Mustard Sauteed Brussels Sprouts Salad today in hopes that it will cure me. Oh, and the fact that it’s a great side salad/dish for Thanksgiving and all the Holidays coming up. Convenient? I think not. Think of this dish as flavor fav fall salad meets a hot superfood salad and then they made out together in a vegan cashew cream mustard sauce pool! Sorry, did I just totally ruin the moment for you? Okay, so where was I? Ahh yes, trying to be professional and talk health perks. 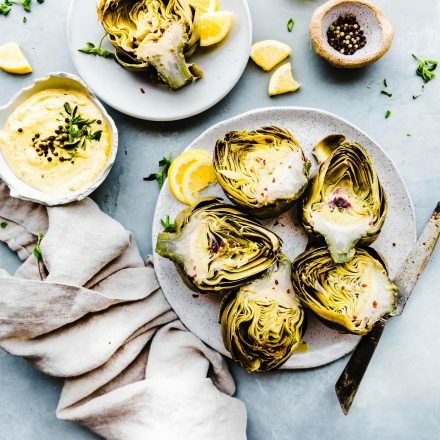 In all seriousness, this creamy mustard brussels sprout dish, is hearty yet healthy. And yes, I am talking about a vegetarian side dish. It’s Paleo and Vegan friendly and such a POWERHOUSE veggie dish. Especially for those who are needing to reboot their immune system (like in my case) with an extra dose of antioxidants Vitamin K.
Have I lost you yet? Don’t worry, you’ll like, actually LOVE, these nerdy nutrition facts. So pay attention, so you can impress all your guests at your Holiday table. Creamy Mustard Sauteed Brussel Sprouts Salad – Nutrition facts! Brussel Sprouts contain over 25o% of Vitamin K1. Vitamin K is crucial for bone health, reducing inflammation in the body, and preventing blood clots. 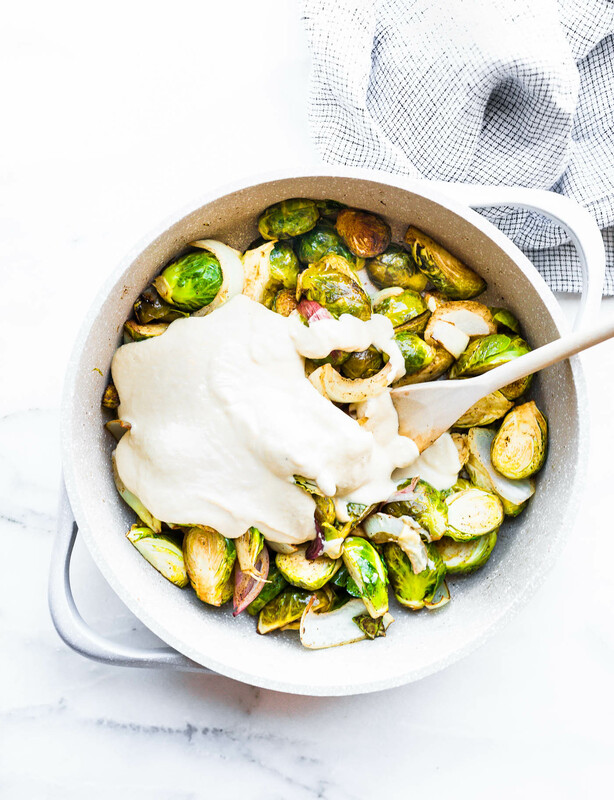 Vitamin K is a fat soluble vitamin, which is why pairing these these sauteed Brussel sprouts in a mustardy cashew cream sauce is key for absorption! You need the healthy fats to absorb more nutrients. Vitamin K is produced in the bacteria of your gut (source), so it’s important to make sure your GUT is healthy and rich in helpful bacteria. Antibiotics, leaky gut, Celiac disease, and food allergies can all inhibit proper Vitamin K absorption. That being said, how do Brussel Sprouts play a role in gut health? Well, they contain Glucosinolates. Glucosinolates help protect the lining of the digestive tract and stomach. In doing so, they can help prevent certain digestion issues, disorders, etc. Which leads me back to that whole HEALTHY GUT thing and Vitamin K. Good bacteria, Good gut health, good absorption of Vitamin K.
Does that make sense? Okay, let me give an example. Me. I just had the flu. My body still has a bit of inflammation low white blood cells. Where should I put the recovery focus on? Well, for one, the focus is on strengthening the gut lining and stomach (with prebiotic and probiotics), reducing inflammation with an anti-inflammatory diet, and combating oxidative stress with foods rich in anti-oxidants. And rest… duh (easier said than done). You see where I am going with this right? The power of FOOD is pretty awesome! 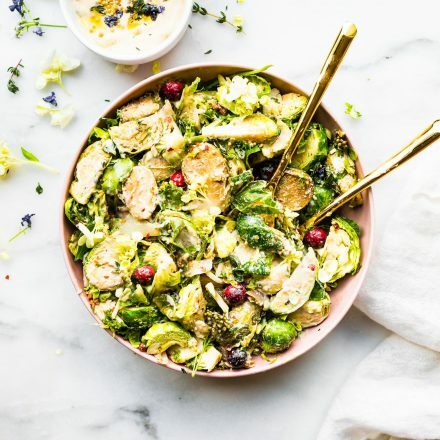 A simple sauteed Brussels Sprouts dish can become a SUPERFOOD dish with just a simple pairing (healthy FATABULOUS creamy mustard cashew sauce). Together, they make a vessel for healing your body. Ya’ll, this is one reason I became a Nutrition Specialist, besides being able to bio hack my own health. Haha. It’s so that we can educate each other on the power of real food. Mix it with your sauteed brussel sprouts and vegetable salad. Gah, so good! So GOOD for you. NOTE –> Don’t worry, if you don’t have cashew cream sauce, you can use a plain hummus or avocado or plain yogurt. Either way, both make for a creamy sauce is similar to a creamy potato salad. The fact that I have included health perks, gut talk, sauteed brussel sprouts and cashew cream mustard sauce making out all in one post just verifies the fact that I am one crazy Cotter. You’re welcome! Happy Almost Holiday! Brussel Sprouts.. your go to recipe… share it! Please? 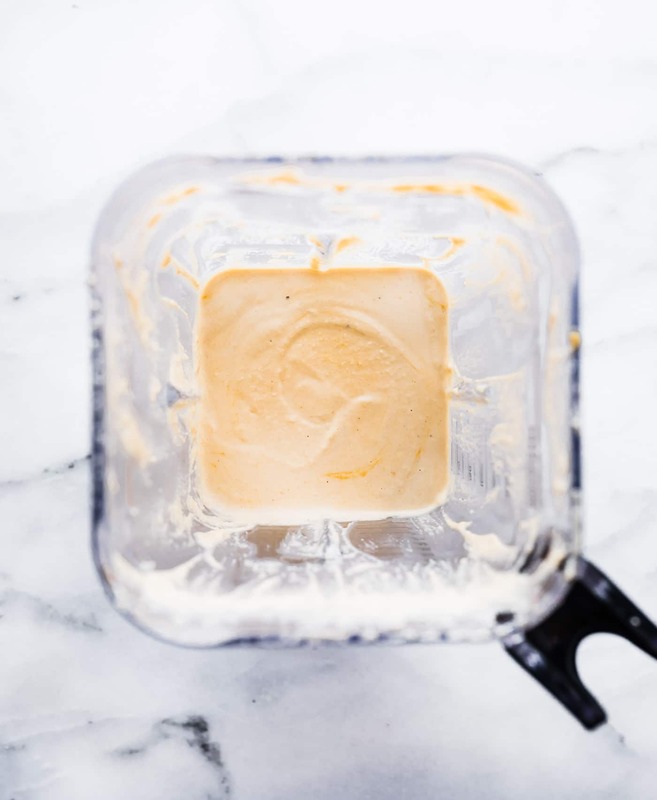 My mustard sauce is one of Alex’s most requested condiments. I loooove me a good mustard sauce! ANd yay for brusslels! i need your recipe! do share! OMG I made something similar recently but in the oven so I have no about how good this is. I’m pretty sure I’m going to be putting this sauce on everything! So yummy! I will never understand people who don’t like brussels!!! SOOO good! I can think of so many uses for this sauce! Hope your are on the mend and feeling better! thanks friend. It’s day by day! <3 you. Oh wow, this salad looks so amazing. I love Brussels sprouts and mustard. Great recipe. i feel like we are related. some much same love of food! <3 you. Oh this sounds (and looks) amazing! Such a sucker for anything with brussels sprouts or cashew cream, so this combination is a dream come true! me too! let me know if you try it Kara! And you seriously out did yourself on this recipe Lindsay!! I’m swooning. Picking up all the ingredients today at the store. Can’t wait to make this. And Dave can’t have Brussels or cashews (it’s a food sensitivity, not a taste thing)so this is all for me!!!! poor dave! But YAY you! haha eat all the Sprouts! Brussel sprouts are one of my favorite, favorite vegetables! Pretty sad that they’re a bit underrated! I had to Pin this recipe because it looks so so delicious. Veggies are my fave, hey! My Mum refuses to make brussel sprouts so my Dad has been begging me to make them and I think I may just have to do that after seeing this recipe! YUM! The good news. I’m teaching yoga. The bad news. I’m behind on reading my favorite blogs and I might have missed this yumminess. I’m the only one in our family that eats Brussel Sprouts. With this recipe I might be able to convince the family to try them. I needed this like yesterday!! YUMMY!!!! we so need to live closer! I want to make these ASAP!! 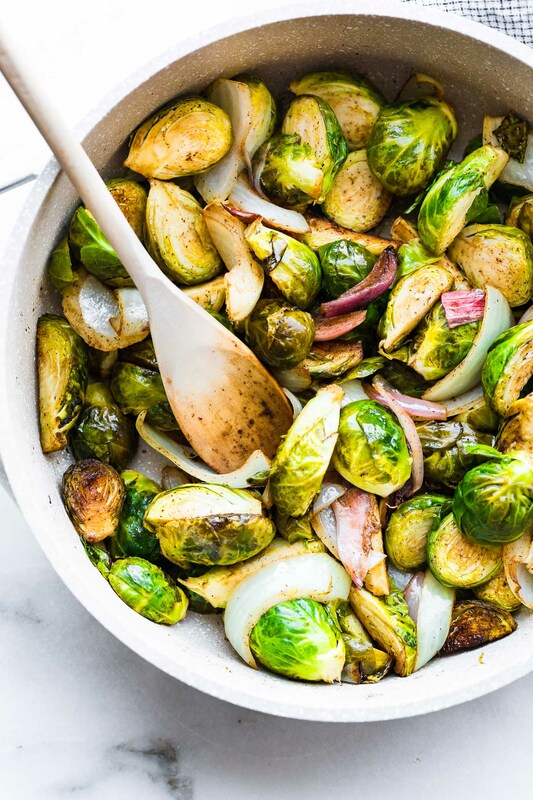 I only recently started to like brussel sprouts, and this recipe is like the mother ship calling me home! Okay, that was a tad dramatic – but I literally can’t wait to try this! This looks amazing! Just wondering about what the problem is with hummus? I’m sensitive to Cashews. Could I try with almonds? Thanks! You can totally use hummus. Go for it! You might have to thin it out a little but should be great. Keep me posted. 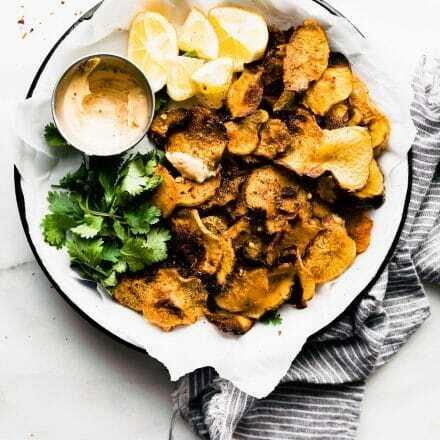 My partner is supposed to avoid cashews as part of a cancer fighting diet but this recipe sounds like something we would enjoy.. Do you think there is a sub for cashew that would do the same thing? Can he have egg or dairy? Had this tonight for dinner. Really good. Thanks for sharing! How did you make this dish? It’s so tasty. thank you! Ugh, i think I need antibiotic. BOO! 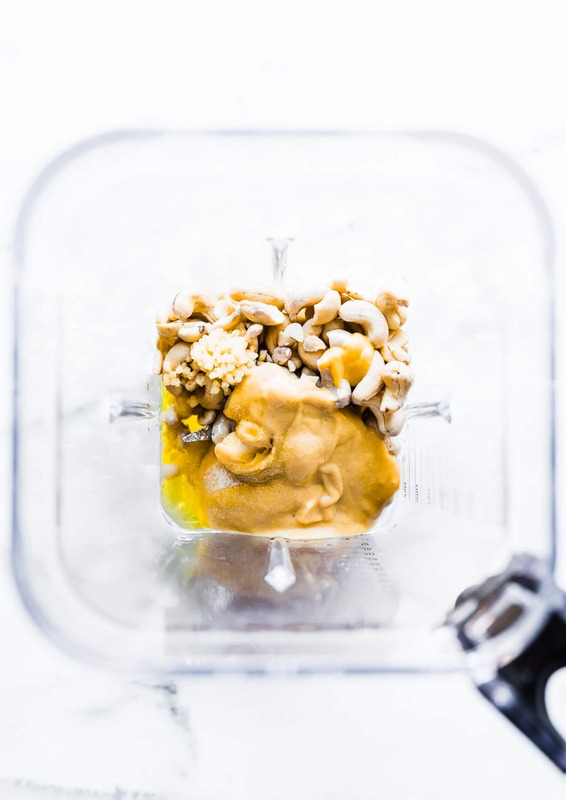 Do you think you could use cashew butter thinned with a little cashew milk? It sounds wonderful but would like to use what I have on hand. That might work! I honestly think it’s creat with hummus too. If you used cashew butter, use raw or unsweetened. Test the sauce after blending. 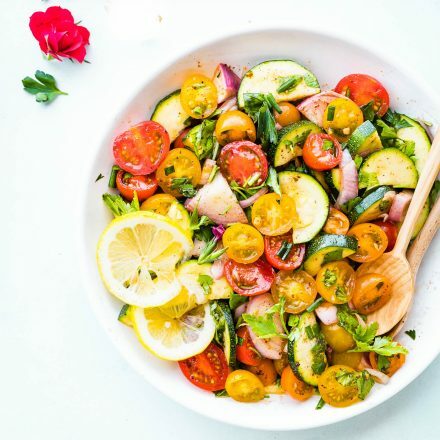 This salad is a green goddess! No one EVER has to tell me to eat Brussels sprouts twice! 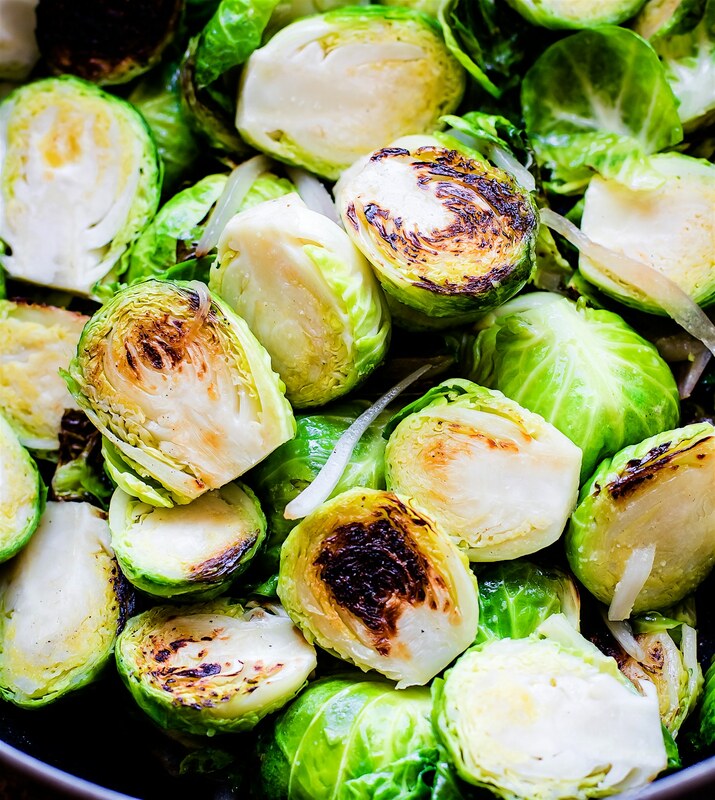 Roasted or sauteed Brussels sprouts are my favorites–raw…not so much. 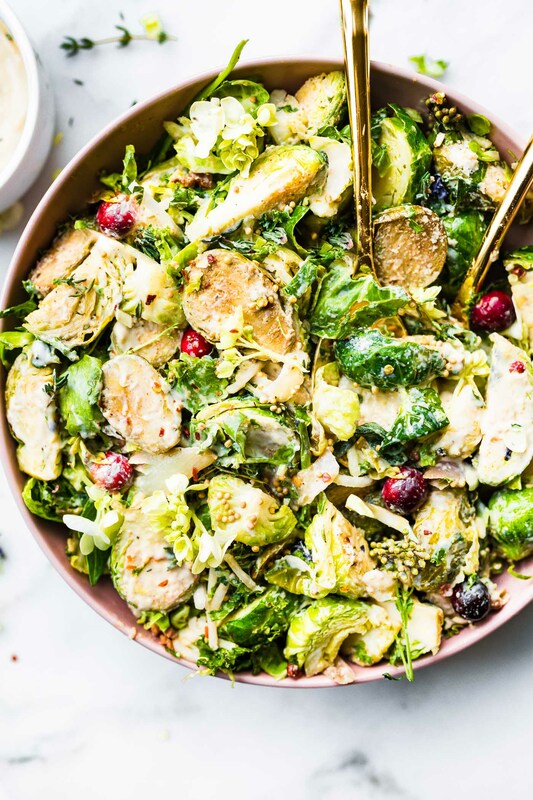 This mustard Brussels sprouts salad looks wondrous! I normally wouldn’t like mustard sauce, but this looks like such a winner that I’d have to try it! I’ve been looking for a ‘kicked up’ brussels sprouts recipe. I love the oven roasted recipe I have but just looking for something different and this came at the perfect time… it may even be my greens for Thanksgiving! I made this recipe as a side dish for a vegan Christmas meal. It was so great! My husband isn’t the biggest fan of balsamic vinegar, so I skipped it, but it was the favorite dish of the meal. We made a second batch right away with the leftover cashew sauce. Thanks for the recipe! This turned out absolutely amazing! I know what I’m taking to non-vegan family Thanksgiving next year! Since I used regular whole grain mustard, I added a tsp. of coconut sugar. Perfect! Thanks so much!! !